❤Back to School 2018 is coming. 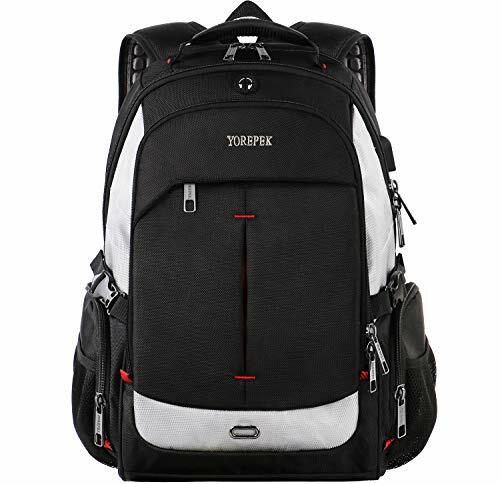 ✔YOREPEK extra large backpack keeps your school supplies organized. * Comfortable, Ergonimic and Adjustable thicken straps with padded back cushion brings you great comfort and allows for a snug fit. The BACK is thickly padded allowing air to circulate while in use. If you have any problem, please contact us immediately. Sophia shop promise to provide you with reasonable price, good quality,excellent service and 12-MONTH limited warranty. ❤️️TSA Friendly Design: The large travel laptop backpack offers a quick access to moving through the airport security at checkpoint, ensures a hassle-free laptop-in-bag TSA scan and keeps your items organized by simply unfolding the Separate Laptop Compartment to 90-180 degree. Without taking your luggage out, the traveling backpack is ideal and well made for international airplane travel, business travel, overnight camping, hiking, daily use at school, work commute, weekend getaways etc. ❤️️USB Charging Port & Headphone Cord Hole: USB charging port plugged into external interface and built-in charging cable inside offers an easy and convenient access to charging your laptop, iPhone, iPad, kindle and other electronics devices when walking or travelling outside without opening up the large laptop backpack. Equipped with headphone cord hole outside makes you freely listen to music on the go. ❥NOTICE that this backpack DOESN'T power itself. Seperate Power Pack is NOT included. ❤️️Multipurpose & Perfect Gift: Adjustable padded shoulder straps make it easier and comfotable to carry, perfects for school, daily walk-around, business traveling, shopping, professional office work and other outdoor activities. Sensible practical gifts and presents perfect for birthday, graduation season, Back-to-School season, Black Friday, Christmas and other festivals. Big student backpack for men, women, boys, girls, teens, college students, high school students.